Trying to lower your blood pressure by watching sodium intake? Use herbs such as basil and other strong ingredients such as lemon, garlic and pepper for lots of flavor. 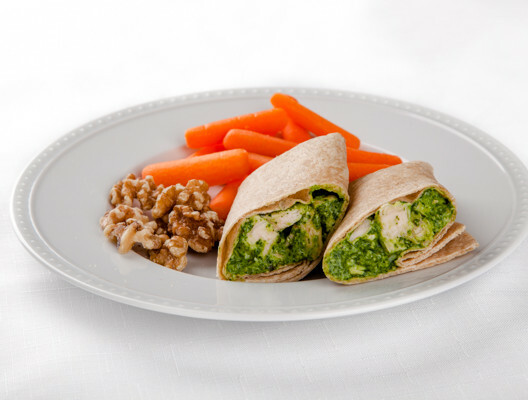 This wrap is also a great way to work in more vegetables with the spinach. Preheat the oven to 350 degrees F. Spray a baking sheet with cooking spray. Season the chicken breasts with 1/4 Tsp. black pepper and dried basil. Bake for 35 minutes or until done. Put the chicken breasts in the refrigerator to cool. In a food processor, combine the spinach, pine nuts, lemon juice, and mayonnaise. Lightly pulse. With the machine running, add the olive oil, blending until the mixture is creamy. Stir in the Parmesan cheese, garlic powder, and 1/4 Tsp. black pepper. Cut the cooked chicken into 1/2-inch pieces and shred. In a medium bowl, combine the chicken and pesto sauce; mix well. Serve 1/2 cup chicken salad in each tortilla. Fold in the two sides of the tortilla and roll like a burrito. You can serve these immediately or wrap tightly in plastic wrap and refrigerate.